CAB is proud to announce our 2018 Don's Night Out! Don's Night Out (DNO) is CAB's newest signature event, which debuted in August 2015. DNO welcomes incoming and returning students into Bay Area culture. This year, you will see influences from neighborhoods around San Francisco! 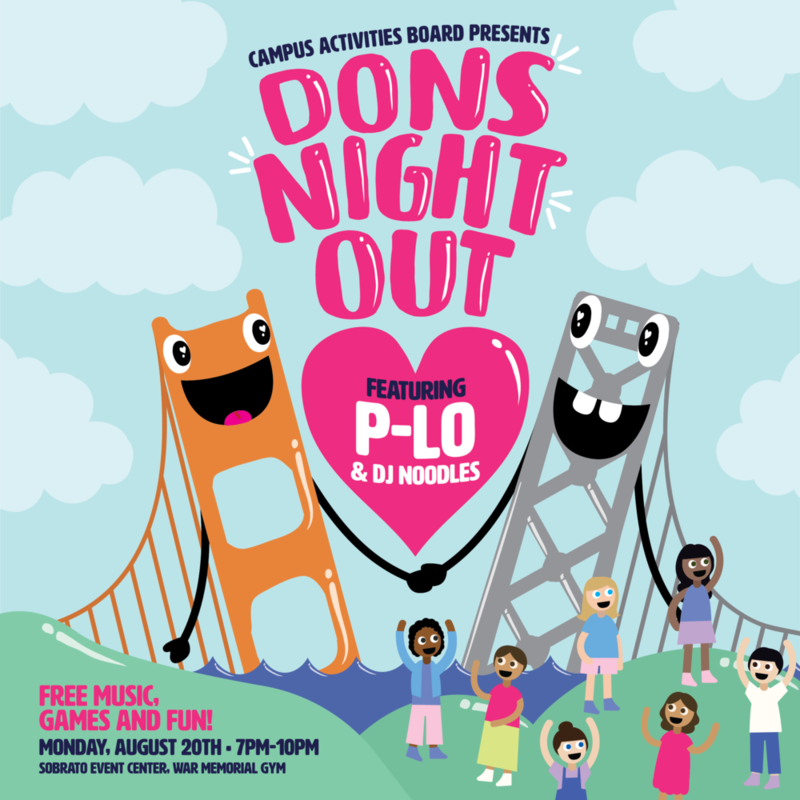 DNO will have FREE games, activities, food, and to top it all off -- a musical performance from Bay area artists, P-Lo and DJ Noodles! Make sure you keep up to date on all of our social media accounts to hear more about DNO, Meet & Greet giveaways and more! This year's Don's Night Out Headliner is... P-lo! P-Lo is a founding member of the Bay Area collective HBK Gang (Iamsu!, Sage The Gemini, Kehlani and more). As a solo artist, P-Lo has been steadily on the rise, releasing projects that continue to push him further into the spotlight. As a producer, P-Lo has made hits with Yo Gotti ("Act Right"), Flo Rida ("GDFR") and B.o.B. ("Not For Long") to name a few (paradigmagency.com). Listen to his mixes below! Opening at this year's Dons Night Out is... DJ NOODLES! Noodles (Micah Mahinay) is a 25 year old DJ based out of San Francisco, but now resides in Los Angeles CA. She was first exposed into the night life at age 16. In 2008 Noodles had discovered her fathers turntables and began to practice how to properly mix and scratch on vinyl records. From having an online presence she utilized her following to bridge her fashion and music background together by playing many trendy parties and festivals (send-noodz.com). Noodles brings the vibe of R&B classics, mixed with modern day rap, integrated with an electronic sound. In early 2014 an R&B singer who goes by "Kehlani" had approached Micah and asked her to be her tour DJ. Since then the 2 artists have been touring while hosting many parties in different cities together (send-noodz.com). Listen to her mixes below!